The 3rd Annual Pethick Archaeological Site Open House will be held Monday, June 30th, and Tuesday, July 1st, 10am &#8211 2pm on Smith Road in Central Bridge (directions below). 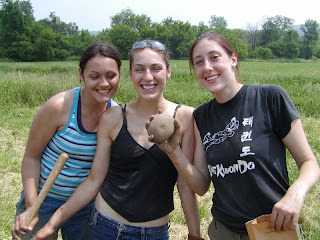 The Pethick Site is in its fifth season of excavation as an archaeological field school co-taught by the University of Albany, SUNY, and the New York State Museum. It is a rich and important Native American site, and to date has yielded almost 200,000 artifacts and 350 soil features. Evidence recovered in the excavations suggests that this location has been used for several thousand years by the indigenous people of the Schoharie Valley. The Pethick Site is a newly discovered village and campsite located on a terrace overlooking Schoharie Creek, a major tributary of the Mohawk River. The site was discovered by the class of the 2004 summer field school based on information provided by local artifact collectors. A shovel test pit survey of the site indicated that there were extensive and rich archaeological deposits present. These were concentrated at one end of the site on a small rise in the local topography. Initial excavations were concentrated in that area. Our excavations first uncovered a dark black organic layer, believed to represent a decomposed trash midden dating from the most recent occupations of the site. Based on artifacts recovered from the midden layer, the most recent and most extensive occupation at Pethick dates from approximately AD 1000 to AD 1400, a period archaeologists refer to as the &#8220Late Woodland Period&#8221 in northeastern North America. The occupants of the Schoharie Valley at that time are generally believed to have been the ancestors to modern Iroquois cultures, including the Mohawk. Remains from that period at the site include numerous hearths, fire cracked rock deposits, storage pits, and post-mold patterns. Artifacts from the site include numerous chipped stone waste flakes, stone tools including projectile points, and potter sherds. Preliminary analysis suggests the presence of at least one longhouse. While the discovery of a possible early Iroquoian village site is a major occurrence, there is more to Pethick than this. Soil stratigraphy and artifacts indicate that Pethick is a multicomponent site, which was repeatedly occupied over thousands of years of prehistory. Artifacts recovered during the 2004 season indicate occupations during the pre-agricultural Early and Middle Woodland Periods, from approximately 1,000 BC to AD 200. Also identified were artifacts indicating occupations during the preceding Transitional Period, from approximately 1,500 to 1,000 BC. During these early periods the site probably served as a seasonal encampment where occupants could take advantage of locally gathered plant and animal resources, including fishing in the nearby Schoharie Creek. We have been informed by local collectors that the site may also contain remains from the Early Archaic Period, dating to as early as 8,000 BC. If true, this would be a very rare occupation, dating to one of the earliest periods of New York State prehistory, just following the end of the last Ice Age. Surveying the areas purported to contain this evidence will also be a priority of the next field season. Visitors to the site will be given tours by university students, but they are welcome to explore at their own pace and stay as long as they would like. Professional archaeologists, including State Archaeologist Dr. Christina Rieth and Dr. Sean Rafferty of the University at Albany, will be on hand to look at private artifact collections, which visitors are encouraged to bring. The site is fairly easily accessed (in a farm field). For safety reasons, guests will not be allowed to excavate. Visitors of all ages are welcome! There is no cost for this event. From Albany: Take I-88W to Exit 23&#8211 Schoharie/Central Bridge. At the end of the ramp, turn right. At the flashing red light, turn left onto 30/7A. Cross the Schoharie Creek, then take your first left onto Smith Rd. Follow to the end&#8211 the site is visible on the left.